Carolina, NOW LUCY, HAS BEEN ADOPTED!! GREAT NEWS!!! Carolina, now Lucy, has found a wonderful new family. They fell in love with her personality, and we're confident that she has such a bright future ahead with them. 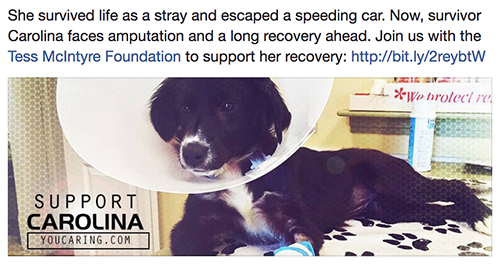 Carolina has a long road to recovery, and we need your help to help her! She survived life as a stray and escaped a speeding car. Learn more about her story below. HELP TESS SUPPORT CAROLINA! Carolina has a long road ahead, and we're helping fund her recovery. Will you help us? Learn about her story and watch her video!